Sōsuke and Oyone were without question a loving couple. In the six long years they had been together they had not spent so much as half a day feeling strained by the other’s presence, and they had never once engaged in a truly acrimonious quarrel. They went to the draper to buy cloth for their kimonos and to the rice dealer for their rice, but they had very few expectations of the wider world beyond that. Indeed, apart from provisioning their household with everyday necessities, they did little that acknowledged the existence of society at large. The only absolute need to be fulfilled for each of them was the need for each other; this was not only a necessary but also a sufficient condition for life. They dwelled in the city and though living deep in the mountains. 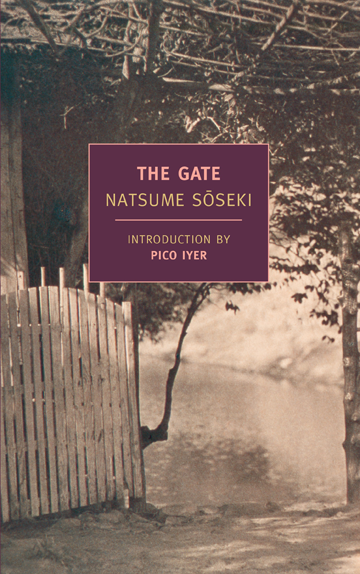 Natsume Sōseki’s 1910 novel The Gate, translated by William F. Sibley, is a story of an ordinary couple living an ordinary life. Their trials are ordinary trials, involving money, health, and family, and the crisis that drives the novel is a rather ordinary search for meaning. Certain specific aspects of their life, and their reaction to it, might be characteristically Japanese, but as I read, I was struck by how easily the events of the novel could be transferred to just about any place and time because the struggles the couple faced seemed so very universal. At times, I forgot I was reading a book about set more than 100 years ago on the other side of the world. The couple married under inauspicious circumstances, the details of which are never fully explained, and they’ve muddled through life ever since. Sōsuke’s brother has recently shaken up their circumstances by coming to live with them, but it’s a quiet upset, not played for melodrama. Their most significant ongoing pain comes with their lack of children, which perhaps contributes to their feeling of restlessness and disconnection from life and the world. They react to the ennui in quiet ways, often putting a great deal of deliberate thought into any action they take. If you haven’t guessed by now from my description, this is not the sort of book in which a lot happens. The lack of happenings is part of the point. In cutting themselves off from the wider world, Sōsuke and Oyone have cut themselves off from the kinds of events that would ordinarily become the plot of a novel. So instead, we get a chapter devoted to their angst over selling an inherited decorative screen. The one rather big step that Sōsuke takes toward the end of the novel is a step toward greater quietness, not less. And it’s a step he takes to avoid what could be a dramatic confrontation. Some might find this book dull, but I thought it was lovely and painful, just as life is so often lovely and painful. This was my second book for Tony’s January in Japan event. If you’re interested in more Japanese lit, check out the event blog. Sometimes I really like books like this that are all about the quiet, everyday issues we deal with in families- because after all, that’s what my life is made up of. I don’t have any huge upheavals like the more exciting novels! I feel the same way. It’s nice sometimes just to read about ordinary life. >>Some might find this book dull, but I thought it was lovely and painful, just as life is so often lovely and painful. I hope you do! I think you’d enjoy it. I’ve just added The Gate to my to-read list…and I might add it to my Classics reading list (although I might need to institute a two-read, one-added policy because my list is growing much faster than I’m reading). Thank you for posting this review; I’d not heard of Sōseki before, and his writing sounds like the type of writing I really enjoy reading. I hear you on the growing list. I made peace with mine by deciding that my to-read list was just a pool of reading options. I read another book by Sōseki, I Am a Cat, a few years ago, and it was charming, if a little long. I’m very interested in reading this since my friends and I have an on-going debate about the levels of happiness of people who live(d) in “small” worlds and those who strive for “more”. It’s an interesting question. I was just talking about that very thing with a friend a couple of days ago. I tend to think being able to find contentment in a small life is a good thing. My mother recently told me that if I wanted to read beautiful Japanese, I need to read Natsume Soseki. I still haven’t but I’m planning to! I love the thrill of reading a book with a fast paced plot but sometimes you need a breather and a novel like The Gate seems just the ticket.